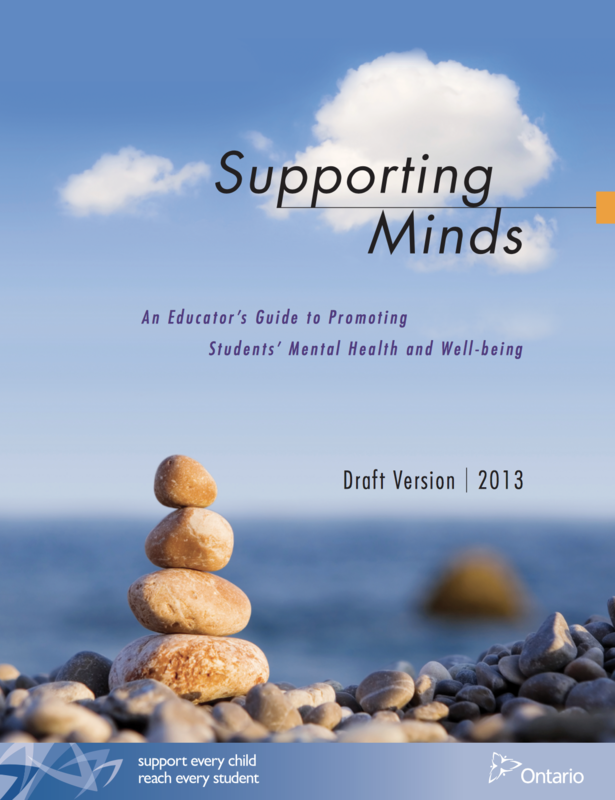 Supporting Minds is a guide that aims to build school-based capacity in promoting awareness, prevention and early intervention of mental health and addictions issues. The first part provides a general overview of mental health and addiction problems. The second part outlines the most common mental health problems among students and includes strategies to support them. How Do Mental Health Difficulties Develop? Most children develop into competent, confident, and caring young people, sometimes against incredible odds, but it is quite possible that at some point along the way, they may find themselves facing mental health difficulties. One in five does, and often the question is why? Sometimes genetics or temperament can make it hard for some children to maintain good mental health, especially when the adults around them have not found ways to accommodate their needs. Sometimes hardship, neglect, or family stresses that have lasted for a long time can leave a child vulnerable to mental health difficulties. When more than one of these factors is at play at any given time, it is easy to understand why a child might be affected by mental health difficulties. Being affected is not the same as being “doomed”, and mental health difficulties need not be more than a temporary impediment, even in the face of ongoing challenges. Learning to respond well to challenges can actually strengthen overall mental well-being. What Is Meant By A Mental Health Disorder? When licensed professionals, such as doctors or psychologists, make a diagnosis of a mental health problem, they refer to a reference guide, Diagnostic and Statistical Manual of Mental Disorders, Fourth Edition (known as DSM-IV), to help them determine if the difficulty meets the criteria to be called a disorder. Sometimes a diagnosis helps educators, families, and counsellors plan how to help a child succeed. As much as possible, the term “disorder” has been avoided in the Fact Sheets to emphasize that their purpose is not in any way to replace the process of seeking a professional assessment and diagnosis when needed. What does the difficulty look like? The difficulties experienced by many children with mental health problems can sometimes be seen as being disruptive and/or unruly—similar to children who just need more structure or direction. Or the difficulties may drive children inward, and they can just seem introverted and quiet when perhaps they are anxious or sad. Because teachers spend so much time with their students in a setting where the students are required to be engaged, they are often the first to notice a mental health difficulty. When close attention is given to the student’s behaviour, mood, and how they communicate with others, it may be possible to tease out with a little more clarity whether they are struggling with issues affecting their mental health and develop focused approaches to supporting them—emotionally, behaviourally, and academically. Jane was well liked by her teachers, who saw her as a talented writer and easy to have in class. When she started to develop a sore stomach every afternoon before recess and acted belligerently when the teacher insisted she have some time outdoors, everyone was surprised. The vice-principal wondered if Jane might be anxious about something, and called home. Mom was able to share that Jane’s dad had moved out of the family home, and Jane seemed to be needing more “alone time”. She had always found it hard to be with larger groups of students and anxiety was getting the better of her. Once these details were uncovered, everyone was better able to set a less stressful pace and a plan to help Jane manage her social anxiety. What is the impact? In order to develop a range of strategies to support children, it is important to consider how much distress the child’s problems are causing them and those around them. Risk: What factors have initiated and maintained the problem? It is important in thinking about the causes of a child’s difficulties, and any possible solutions, to consider all those aspects of the child’s life that may have contributed to the difficulties, whether within the child him/herself or in the school, home, or wider community. Strengths: What assets are there to work with? Family, community ties, strong academic skills, athleticism, sociability—these can be used as foundations to support a child through a mental health challenge. Strengths are often equated with “pleasing” or “accommodating” behaviour, and it is very easy to fail to catalogue and use some of the “less pleasing” strengths to good effect. It is easy to say “strong-willed and stubborn are synonyms for determined and persistent”—it can be harder to truly admire those qualities as assets and figure out how to use them to help a child get on track. Sometimes, too, negative assumptions or worries about children, especially about their mental health, can divert attention from their budding strengths and deprive them of the nurture and positive encouragement they need to thrive. A famous Canadian comic recounted how in school, his comedic talents had gone relatively unappreciated because his ADHD was so frustrating to contend with. But one observant teacher promised that for each day that he was able to meet certain core expectations, he would be able to have five minutes of audience time at the end of the day. That motivated him to build the skills he needed to manage his symptoms more effectively… and helped launch a successful career. access to reliable, focused information and resources—the Fact Sheets provided in this chapter are meant to serve as a compass to indicate the right direction to support student success. access to a team of allies who are able to tilt things back in favour of a child’s success—the emphasis in this Guidebook on partnerships and working as a team is meant to keep everyone travelling together to guide children toward success. Mental health issues can go unnoticed in classrooms or can be disguised as something else. Externalizing behaviours that prevent students from learning or participating appropriately in school life may be easy to spot, but it can be hard to know what is behind the behaviour or what can alleviate it. Other students— the “quiet ones”— may struggle with mental health issues in ways that do not disrupt classroom life, but there is still a sense that “something” is interfering with their ability to learn and benefit from school life. Either way, in the midst of the myriad activities crammed into a school day, it can sometimes be hard to pin down the basis for the concern felt when a student is faltering in some way, and it can be hard to explain these concerns to parents/caregivers. At the same time, it can be hard to know what help can be expected from community partners, and how to access that help. The Fact Sheets are meant to describe some of the common mental health difficulties that children may contend with, how they might appear in a classroom, how to respond effectively, and how to get extra help when needed. The Fact Sheets in this chapter are directed to each of the advocates in a child’s life, providing information about and suggesting responses to children’s mental health difficulties.